Coffee contains a protein that has an effect similar to morphine, specialists at the University of Brasilia and Brazilian agriculture research company Embrapa have discovered. Moreover, the new substance’s effect lasts longer. The research was conducted by Felipe Vinecky of the Molecular Biology Department at the University of Brasilia (UnB) in cooperation with the Genetics and Biotechnology Division of state owned agriculture and livestock research company Embrapa. The research involved searching for and combining coffee genes to affect quality. In the course of study, the scientists managed to find new substances in the product. 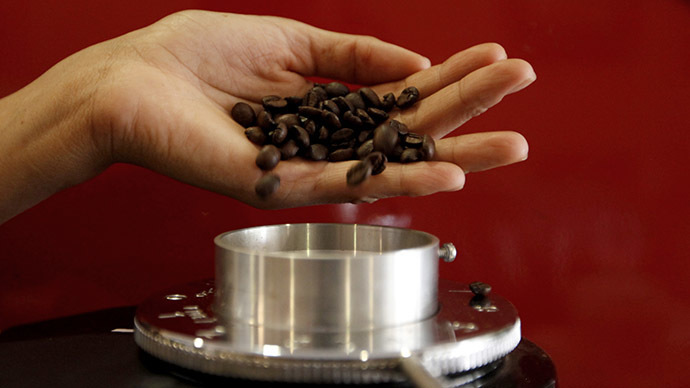 While analyzing the coffee genome sequence and corresponding proteins, Vinecky and his research adviser Carlos Bloch Junior found some proteins similar to those typical for humans. So they decided to synthesize their structural analogues and test their properties. The researchers "identified previously unknown fragments of protein — peptides — in coffee that have an effect similar to morphine, in other words they have an analgesic and sedative activity," the Embrapa company press release said. Both the University and Embrapa applied for patents to the Brazilian government for seven proteins they called "opioid peptides." Those peptides "have a positive differential: their effects last longer in experiments with laboratory mice," the press release said. According to the scientists, it lasted up to four hours and no side effects were recorded. Embrapa believes their discovery has great “biotechnological potential” for the health food industry, and could also help to minimize stress in animals at slaughterhouses. In 2004, Embrapa succeeded in determining the sequence of coffee’s functional genome and the discovery made it possible to combine coffee genes with a view to improving the quality of coffee grains. Thanks to this achievement, the researchers managed to discover the new peptides. Embrapa is a state-owned company affiliated with the Brazilian Ministry of Agriculture. Embrapa conducts agricultural research in many areas including livestock and crops.